Ah, Teddy -- what a warrior for social justice (take that, those of you who use SJW as an insult), fists clenched, wielding time disruption like a bomb in the cause of love and understanding, determined to forever destroy the infinite loop of hate. It takes her a while, in this book, to start fighting, though. I can't praise the art and visual storytelling here enough. 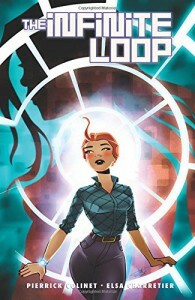 Making a story this complex comprehensible, with its leaps in time, multiple timelines, multiple versions of the same character, is no mean challenge; Elsa Charretier does it with dazzling brio, establishing visual cues to guide the reader, such as shapes and color schemes, and filling the pages with dynamic motion that tells the story. Plus there are creative ways of representing Teddy's thoughts such as decision trees and conversations with other versions of herself; it's humorous, colorful, and vivid. Then there's the story; as much a manifesto as a narrative, but what a well-written one. Characters are somewhat caricatured, but they play their parts well enough, and the love story of Teddy and Ano is pretty touching. The plot development is what it takes to shake Teddy out of her pessimistic conviction that human nature never changes, an infinite loop; after all, even in her "safe" time people are hated (time agents call Ano an "abomination"). Given that the struggle for racial civil rights is a recurring theme in this story (a key event in Teddy's career was witnessing an act of Klan violence in 1964 Mississippi), it's with conscious irony that the authors made Tina black. The reason the loop is infinite, after all, is that anyone, no matter what exclusion they or others like them have suffered, can and usually will turn around and find someone else to exclude. So believing that tolerance can keep expanding takes a real leap of faith. I have only one real complaint, and that's the translation; it would hardly be going too far to call it dreadful. I have only been able to find bits and pieces of the French version on line, but just looking at the English shows a multitude of faults. What exactly is a line like "Passiveness and cowardice are parents of humanity" supposed to mean? There were at least a half dozen times I wished I could check the original to figure out what was really being said. A couple of times Ano apparently cracks a dirty joke, but it's incomprehensible in English. The French version calls people creating time anomalies "forgeurs"; this is simply translated as "forgers", but that is not quite an equivalent word. Anyone with a basic competence in English should know we no longer use "men" to refer to all humankind, even if "les hommes" is still acceptable in French. And on and on. Well, even if the words get a bit lost, the story and the art are there... and can be thoroughly enjoyed as a funny, exciting, militant experience.